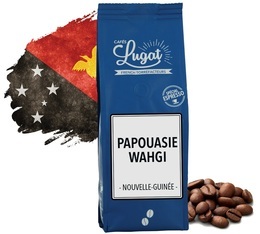 These Papua Wahgi coffee beans come from the country's mountains, near the Wahgi Valley. The in-cup result is a sweet coffee with notes of nuts and brown sugar. Medium roast designed for good espressi. Packaging: 250g. This Papua Wahgi coffee is a label coffee. Up in the mountains of Papua New Guinea, we find the Sigri plantation, which grows some of the finest gourmet coffee in the world. The coffea plants grow at altitudes of around 1,500m, where they benefit from a cool climate and plenty of rain. They grow under shade trees, which protect them from the wind, sun and heavy rain. These trees are also home to plenty of local birds. All the coffea plants on the plantation are of the Typica variety. The Sigri plantation pays special attention to quality control. Every coffea fruit is hand picked and carefully checked. The cherries must be really red, as this shows that they are full of sugar and acidic. The carefully selected harvested cherries are then pulped on the same day. The parchment coffee, meaning the coffee bean still covered in its shell, is immersed in water for several days, which greatly improves its quality. It is then dried naturally in the sun. Located in the Melanesian archipelago, Papua New Guinea covers the eastern part of the vast island of New Guinea. The whole of New Guinea is considered the third biggest island in the world, after Australia and Greenland. The other half is made up of the province West Papua, which belongs to Indonesia. The country grew its first coffea plants in around 1800. Approximately 95% of the coffee made in Papua New Guinea is wet-processed Arabica coffee. The rest is Robusta coffee, grown on the plains. In Papua New Guinea, nearly a million people live off the coffee industry. The population tends to be split into tribes, who live in small villages in clearly defined territories. Around 90% of smallholder coffee farmers work together as a cooperative to wet-process their harvest, while 76 large producers produce close to 25% of the country's total exports. The mountainous geography, deep valleys, shaded forests and humid climate are the perfect conditions to create a quality coffee. Smallholder coffee farmers take care of a plot of 2 hectares or less, on which there are between 20 and 600 coffea plants. Some 80 plantations or estates are registered. The most famous among them are the Sigri, Bunum Wo, Arona Valley, Gumanch and Tremearne plantations. Nowadays, Australian organisations like NASAA and BioFarm Australia assist Papua New Guinean coffee producers towards achieving organic certification . The local coffee industry is monitored by the Coffee Industry Corporation. The country's government has always supported the production of Arabica coffee. At the beginning of every season, it guarantees a minimum sale price for farmers.